While a Terms and Conditions agreement is recommended to have for your website, it’s not required by law to have this agreement. Only Privacy Policies are required by law if you collect personal data from your users: email address, first and last names, shipping address, etc. These are especially important for businesses involved in online retail and eCommerce. This agreement sets the rules that users must agree to in order to use your website. Because of its importance, here are at least 5 reasons why you should have a Terms and Conditions. 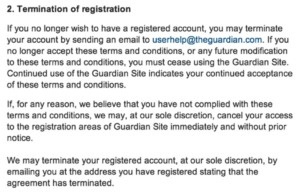 A Terms and Conditions acts as a legally binding contract between you and your users/customers. In the Terms and Conditions you can inform users that you are the owner of such content (as mentioned above) and that the content you own is protected by international copyright laws. The Site and its original content, features, and functionality are owned by and are protected by international copyright, trademark, patent, trade secret, and other intellectual property or proprietary rights laws. These terms and conditions are governed by the laws of the United States of America and the laws of the State of New York.